Silent Night premiered December 13, 2013. Experience an operatic retelling of the World War I Christmas Eve truce. 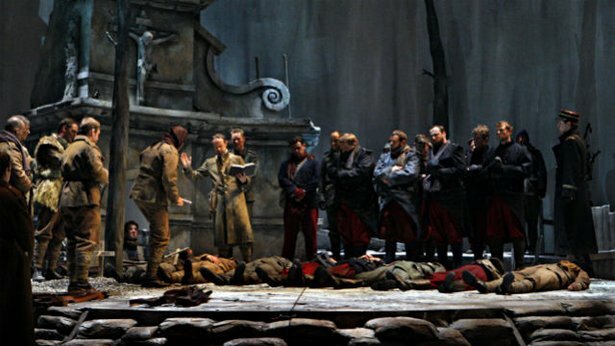 The Minnesota Opera’s production of Kevin Puts’ Silent Night, a company commission which earned its composer the 2012 Pulitzer Prize in Music, recounts a miraculous moment of peace during one of the bloodiest wars in human history. The fascinating true story takes place on World War I’s western front. Weapons are laid down when the Scottish, French and German officers defy their superiors and negotiate a Christmas Eve truce. Enemies become brothers as they come together to share Christmas and bury their dead. The Minnesota Opera presented the world premiere of Silent Night in November, 2011 at the Ordway Center for the Performing Arts in Saint Paul, Minnesota. It was composed by Kevin Puts with libretto by Mark Campbell, based on the screenplay for Joyeux Noël by Christian Carion for the motion picture produced by Nord-Ouest Production.The opera recounts a miraculous moment of peace during one of the bloodiest wars in human history. On WWI’s western front, Scottish, French and German officers defy their superiors and negotiate a Christmas Eve truce. Enemies become brothers as they share Christmas and bury their dead. William Burden starred as the soldier whose voice inspired peace – if only for a day. Silent Night was conducted by Minnesota Opera’s Music Director Michael Christie and staged by Academy Award-winning director Eric Simonson. Silent Night, which was recently honored with a regional Emmy nomination, was the first commission of Minnesota Opera’s New Works Initiative, a landmark program designed to invigorate the operatic repertoire with an infusion of contemporary works. Minnesota Opera’s production of Kevin Puts’ Silent Night is presented by tpt National Productions.